Looking to buy a surfboard but you’re confused? 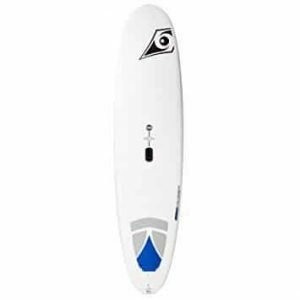 Check out our size guide, and my personal recommendation for the best beginner surfboard. You’re pumped to start your new hobby, and you’ve read our guide on how to surf. Now you need a board. So, which is the best surfboard for beginners? And, what size surfboard do you need? Well, in the next 2-minutes, I’ll offer a personal recommendation; the surfboard I bought as a beginner. But, let’s start with surfboard sizes and types. Because buying the wrong type, or the wrong size board is going to make learning to surf incredibly difficult. 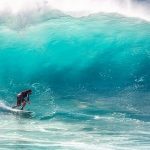 What Type Of Surfboard Do You Need? Foam boards are designed for absolute beginners. This is the type of board you’ll use if you have a taster lesson at your local surf spot. You’ll likely outgrow this board (in terms of its technical ability) within a few surfs. Is it ideal for kids? I’d say no. A Mini Mal board is by far the best surfboard for beginners. It gives you the stability you need to learn, but will see you good right through until you reach the intermediate level. For intermediates, to experts. 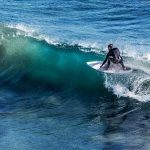 Fish boards help surfers transition to a shortboard, rather than jumping straight from a Mini Mal. Shortboards are designed for experts only. As a beginner, you definately don’t want to buy a shortboard. If you want to get into traditional surfing (rather than longboarding, or SUP), you’ll want a Mini Mal. They offer the stability you’ll need to learn, but they’re a big step up from foam boards. It’s hard to learn anything besides standing up on 1-2ft waves on a foam board. You’ll get bored very quickly. A Mini Mal is flexible enough that you’ll be able to learn to properly paddle, pop up, turn and do some small carves. Depending on how quickly you learn, you’ll then jump to a fish or shortboard. But, the Mini Mal will take you right through to the intermediate level, so you won’t have to ditch it any time soon. 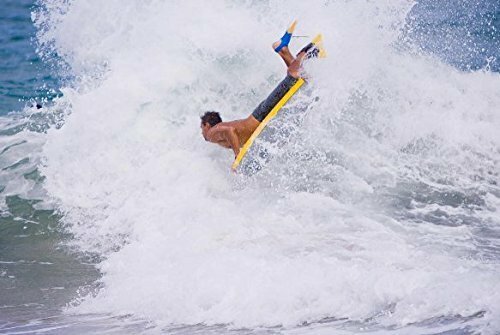 Some beginners jump straight to a fish or shortboard. The problem is, they are just too technical. You’ll find you learn much slower (or not at all), by jumping straight to such a technical board. Buying a surfboard for a child? A big guy worried that you’re going to buy one that’s too small? No problem. Here’s our guide to what size surfboard you need. The size chart below gives an indication of what size surfboard you’ll need, depending on your weight. If in doubt, always go for a bigger surfboard. A longer and thicker surfboard offers more volume, and provides much more stability. And, that’s why heavier surfers will need a longer board. Otherwise, you’ll sink as you paddle, and struggle to catch waves! The key thing to remember here is you are a beginner. And, even as you progress to an intermediate you won’t be carving hard or duck diving. So, having a board that offers a little more stability is only going to help with learning. There’s a tonne of brands to choose from. But, when I bought my first surfboard, I was advised to buy a BIC. I did, and I didn’t regret it. I’d never surfed before, so I chose to go for a bigger board than I should. I weigh around 185lbs, so that would put me in the prime category for the 7ft 10″+ surfboard size. I chose to go above and for a 8ft 4”. And as a recreational surfer, that’s seen me good for a couple of years now. So, all I can recommend from a personal perspective is the BIC Sport DURA-TEC. Unfortunately, it seems like you might have to compromise on colour. They tend to focus on specific colours, for different sized boards, which wasn’t the case when I bought my board. As an example, I bought a 8ft 4” orange and white board. But, it seems most the boards in the bigger range are blue, and the smaller ones are orange; not that it matters. How Hard Is It To Paddle? Paddling out is super easy on my BIC. I suppose my surfer buddies were jealous on the way out, as a longer Mini Mal like this, is a lot easier to paddle than a shortboard. On the flipside, as they actually have the ability to carve pretty hard, I’m sure they’re willing to make that sacrifice. How Hard Is It To Pop-Up? My first day surfing was quite calm and the waves were around 3ft-4ft. They were clean, so it was easy to paddle out. And, as the waves were fairly weak, they were easy to catch too. I was popping up on my BIC within an hour or two. Maybe the technique wasn’t perfect, but who cares. I’m not Kelly Slater. How Hard Is It To Turn? After my first session, I’d say I could angle the rail of the board a little, but it wasn’t exactly a turn. After 2-3 sessions I started turning for more fun, and to keep on the surf longer. So, turning wasn’t very difficult, thanks to the extra stability I got by buying a bigger board. But as I said, they definitely weren’t carves. How Hard Is It To Carve? This board isn’t really designed for carving. I guess you could do some sharp turns, and the experts could easily carve on it; but I can’t. I’m at a stage now where I could jump to a Fish, and the BIC has given me a good grounding so that I can carve when I buy one. 100%. The only thing I’d say is this. 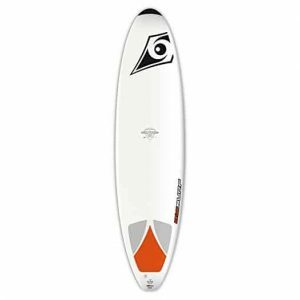 If you plan to be a recreational surfer and never want to upgrade your board, I’d go for the board size that’s exactly right for you, rather than one-up like I did. It might take a little longer to learn the basics (by a little, I mean the odd hour here and there), but you’ll have fun on it for longer. The smaller board will feel a bit more technical than if you went one size up. It’s seen me well for a year or so, but it’s now coming to a point where I need to upgrade. If you plan to upgrade and learn as fast as possible, buying one-up in size isn’t a bad idea. The extra stability from the additional volume will help you learn quicker, and then you can upgrade to a Fish. Most surfboard deals will include a leash, but not always. I was lucky when I bought my BIC, as I got a board bag, leash and wax included as part of the deal. I’d definitely recommend getting all of those things. 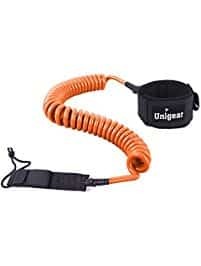 The board bag protects your board, a leash is an absolute must, and without wax, you’ll struggle to stay on the board. Thanks for reading our guide to the best surfboard for beginners. Get onto our email list. We regularly post content for action junkies, and we’ll fire you an email as soon as we post something new.